I always suggest looking around the house for suitable mandrels for wire work (see links below). 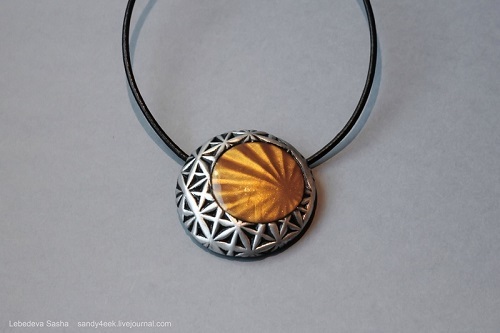 You can also do the same for textures for polymer clay jewelry. Patterned silicone trivets/heat mats are great. But I also like this tip by Sandy4eek which uses cut glass tumblers to create the textures. She presses her rolled out clay onto the tumbler. But I think it might be easier the other way around. Use the tumbler as either a stamp or textured roller! This is not a full tutorial. You do have to add mica powder to the raised surfaces and also cut out the clay to the shape you want. The tutorial is not in English. However, it doesn't really need translating. If you wish to do so use Google Translate or follow my favorite method. For computer users, use the Chrome browser, right click and select translate to English. For mobile device users, use the Chrome app (free) and agree to the translation when asked. OMG what a fabulous idea!! I've never thought of looking in my china cabinet!